Treat your event to the charming, soft, classic sounds of live music on guitar and voice. I play Brazilian Bossa Nova & MPB (think of 'Mas que Nada' and 'The Girl From Ipanema'), along with my own original songs and some great English language songs. I can play a 3 hour set and I am learning new songs all the time. If you have a song you'd like to hear added to my set, please get in touch. I can also work with percussionists if you want an even more lively sound. If you would like me to play at your venue, event or function, please get in touch via the contact page in the menu bar. What does Bossa Nova and 'MPB' (Music Popular Brasileira - Brazilian Popular Music) sound like? Well, here is a YouTube playlist I've made with versions of the tracks I play, by the original artists and covers by established, renowned performers. I also recorded 2 live albums, each one has 18 tracks. The tunes have been played on UK and Dutch radio and have been reviewed all over the world, from the UK to Belgium, to Holland, to the USA , to Japan and Jamaica. 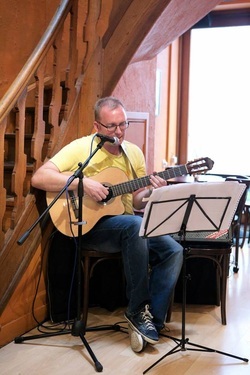 I am playing a specialist Brazilian musical style that has been around for many decades and which is starting to grow in popularity across the world , gaining audiences from all age groups and backgrounds.